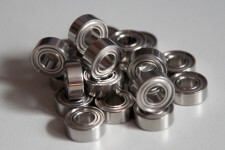 Due to a shortage of bearings, we are using shielded bearings again for now. But don’t worry. These will come with c-clips for easy removal. They perform just as well as our classic KMKs, if not better. In fact, we’re receiving superb feedback for these. Our most recent batches (Noctu & Falcon) were already partially equipped with these new bearings.